Operations Management Suite (also known as OMS) is a collection of cloud-based services for managing your on-premises and cloud environments from one single place. Rather than deploying and managing on-premises resources, OMS components are entirely hosted in Azure. In simple words, what basically happens is that OMS goes and talks to different servers, applications in your environment, collects information about how they're doing, consolidates this information in the form of nice colorful graphics and searchable records, after that presents it to you in one single, convenient place, and it doesn't matter where your servers or applications are running, Azure, AWS, on-premises or which operating system they're running on, Windows or Linux, it just works. Configuration is minimal, and you can be up and running literally in a matter of minutes. OMS help administrator manage their hybrid IT environments more efficiently by giving them a greater visibility into their operational infrastructure. This tool aims to fill the current gap of not having a single point of management for your hybrid, multi-cloud and on premises environments. The most important data out of that is visualized and the other part of it can be searched by writing search queries in a highly scalable log search engine. Real-time monitor, analyzing availability and operational intelligence. Collect, store and analyze log data from virtually any source and turn it into real-time operational intelligence. It has a web-based portal that can be used to manage OMS resources, add configure OMS solutions, view and analyze data in the OMS repository. Simplified cloud management with process automation. Automate manual processes and enforce configurations for physical and virtual machines. Create, monitor, manage and deploy resources in your hybrid cloud environments while reducing errors and boosting efficiency to help lower your operational costs. It has an OMS solution that displays statistics and links to launch the Azure portal for any operations. Backup and restore critical data. Azure Backup contribute to business continuity and disaster recovery. It provides data backup and restore services for OMS. It protects your application data and retains it for years without any capital investment and with minimal operating costs. It can backup data from physical and virtual Windows servers in addition to application workloads such as SQL Server and SharePoint. Provide high availability for critical applications. It provides business continuity by orchestrating replication of on-premises virtual and physical machines to Azure, or to a secondary site. If your primary site is unavailable, you fail over to the secondary location so that users can keep working, and fail back when systems return to working order. Some of the solutions are listed in below screen shot and short description is mentioned for each solution. No need to install infrastructure or any tool! OMS require only some steps that can be completed within 5 minutes. 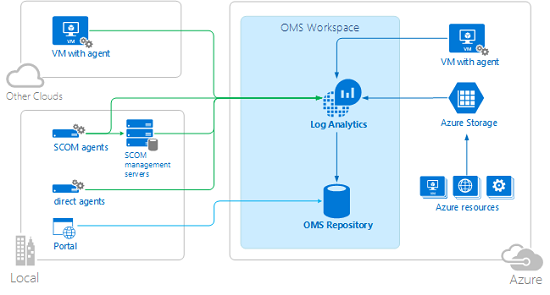 In this article we reviewed OMS evolved, understood what it is, and its four key services, which were Log Analytics, Azure Automation, Azure Backup and Azure Site Recovery. Then shared how to monitor OMS with 5 simple steps. There's a lot we couldn't cover here, but this is only a beginner’s guide and we will probably cover advanced part later in another article. Another important place to find a huge amount of Azure related articles is the TechNet Wiki itself.